Michael Conlan has progressed to the World Championships final in Doha after defeating Belarusian Dzmitry Asanau. The Belfast bantamweight secured a unanimous decision in Sunday's semi-final with a scorecard of 30-27, 29-28 and 29-28. 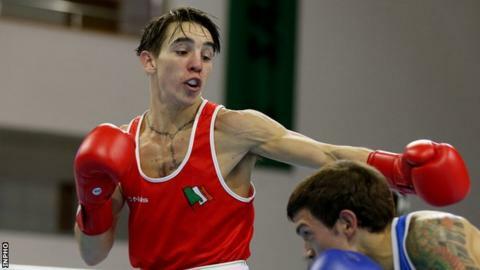 European champion Conlan, 23, has already qualified for the 2016 Rio Olympics. Ireland's other two remaining hopefuls, Michael O'Reilly and Joe Ward, will also fight in the semi-finals. Belfast light flyweight Brendan Irvine lost his quarter-final to Joahnys Argilagos on Saturday. Irvine fought well but had no answer to his Cuban opponent's tight defence and scoring punches. The Belfast fighter lost each round 10-9, though one judge did award him the final round as he battled hard against elimination one fight before the medal bouts.